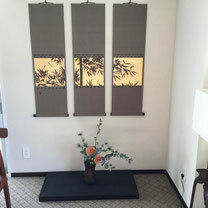 "Japanese Paintings for Contemporary Living Spaces"
Using traditional Japanese painting methods with gold leaf, silver leaf, and natural pigments, Sori creates images reminiscent of printed flower patterns found in everyday wallpaper and fashion. 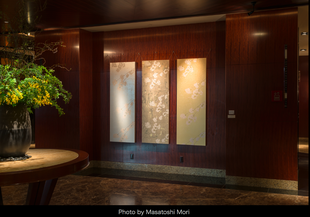 Spinning classic Japanese paintings, these rhythmic, pop floral patterns blend tradition-rooted work with contemporary interior spaces. And yet, unlike reproducible prints, no two flowers are the same. One can feel the passage of time in these flower patterns through oxidation on pieces featuring silver leaf. And flowers that at a glance look identical are in fact each unique in their blossoms and stages of fading. 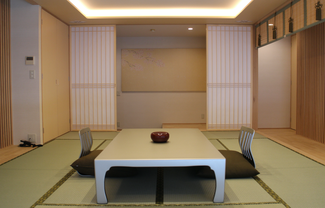 Sori takes the Japanese tradition of painting flowers from close observation of the seasons, and introduces this into modern living spaces through these repeated flower patterns. Sori strives to close the distance between artwork and the audience by creating opportunities to experience art for those missing such chances. copyright© Yuuki Sori All rights reserved.